This is the first installment of a feature I plan on running regularly on the blog: a matchup between two cigars that share something in common. This might be the same producer, the same tobacco or similar and see what the differences and similarities between the two are… and especially who the winner is! Going head to head in this matchup are two cheap cigars made by Jose’ Fuego for two large online retailers: the Royal Nicaraguan Claro Robusto, exclusive to Famous Smoke Shop, vs. the Casa Fuego Robusto, exclusive to Cigars International. Although the Casa Fuego has officially a higher price (4$) than the Royal Nicaraguan (2.60$), it seems to go for a similar price on the cigar auction sittes in the US, so I expect both be of similar make, e.e. hand rolled mass produced cigar made on a budget. Add the fact that both are made by the same producer and the question starts to pop up: will there be a real difference among the two? And will a producer like J. Fuego, admired for cigars like the 777 and the Delirium – both small boutique productions- manage to knock off a great cheap mass produced smoke? Just a short disclaimer: both these cigars were given to me by a US BOTL, as neither is available in the UK, and a single cigar of each was smoked. I won’t go in a lengthy review for these but stick more to some general and short (you wish!) impressions. For a Connecticut shade wrapper this is quite dark and very toothy, at the touch it is actually quite rough. Unfortunately the wrapper has quite a few cracks (see below) which would come back to haunt me. Starts a bit muted, mainly on tobacco notes with hints of cocoa and a little sweet spice. It smokes OK, if a bit rough; the burn line is a bit wavy and the draw somewhat looser than I like, but not bad. The ash is not incredibly long, around one inch before it falls off. 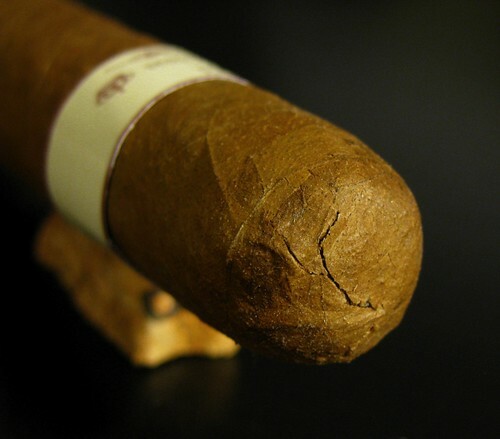 What worries me are the cracks; the one at the bottom is extending along the cigar as I smoke, yet not affecting the burn. The one at the top is starting to unravel. Around the midway point the flavours change a bit, but it’s hard to pick up precise descriptions as these are very faint; maybe coffee and wood. Still a bit rough. I get a really strange smoke aroma for a moment, almost like asparagus, but that disappears… nose going mad? If the cigar was OK but not great till now, it unfortunately goes completely downhill in the last 1/3. The wrapper starts to unravel quite badly, but that’s the last of my worries. It’s the taste that is horrible: burnt rubber and sulphurous aromas hit me like a punch and that strange asparagus note in the resting smoke aroma is back with a vengeance… nothing left to do but chuck what remains away. This opens a bit of a moral dilemma for me: is it right to rate a single cigar without giving it a second chance when you hit a bad one? In a sense it might be unfair, but it reflects real life behaviour; if a cigar is bad the first time I smoke it I really don’t feel like giving it a second chance unless someone I trust raves about it. And this is exactly how I feel about this cigar. This might have been an uninteresting smoke at worst, but the last third turned it into a disappointing cigar which gets a low 66. Price: 79.95$ for 21, but going around 12.50$ for a 5-pack on CigarBid. This stick looks a bit better than the Royal Nicaraguan. The wrapper has a slight tooth and a bit of oily sheen and almost vein free. It has a couple of minor faults (2 small green spot, one sun mark) but a very nice chocolate aroma makes up for that. 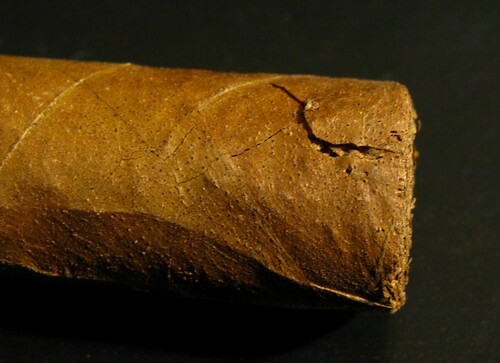 As with the Royal Nicaraguan, this wrapper looks very fragile and thin. It starts with tobacco and quite a lot of spice, more on the tongue than in the throat. Not very smooth. The burn is OK, but the cigar is swelling up along the burn line which causes some cracks to form. Having said that it produces loads of smoke and it holds a quite impressive ash. 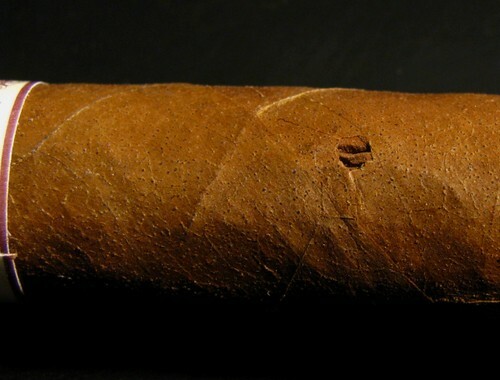 Going on, those cracks start to give burn issues, although they do not unravel as the Royal Nicaraguan did. The flavours are not terribly complex but I can pick up a little sweetness and green wood on the tobacco. Close to the last 3rd it hits a sweet spot and coconut and a buttery sweetness come up for a few minutes but fade quicker than I would have liked. It finishes on nutty and woody notes on plain tobacco background and some more spice, pepper this time. The Casa Fuego didn’t blow me away, but still gets a decent 74 points. It’s pretty much what I would expect from a mass-produced smoke: average taste, decent construction but nothing to write home about. It doesn’t take a committee of experts to see that I liked the Casa Fuego a lot more than the Royal Nicaraguan. Still, neither of the cigars really impressed me so as much as it pains me, Mr. J. Fuego did not pull a rabbit out of his top hat with either of these cigars. Neither is a smoke I’d buy again, though I would smoke the Casa Fuego again if I got offered one or got one in a sampler… but neither is a winner. Keepers of the Flame on the Casa Fuego Belicoso with an extremely detailed intro on J. Fuego. 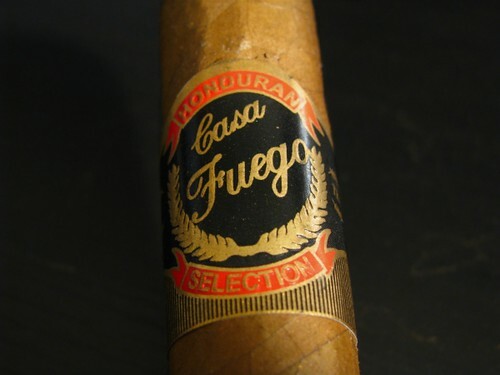 Videoreview of the Casa Fuego Torpedo on nice tight ash. 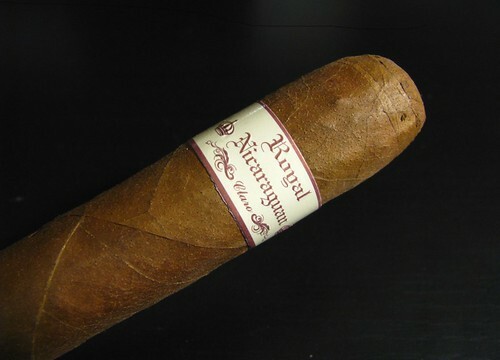 Mr B’s review of the Royal Nicaraguan on the UK Cigar Forum. This entry was posted in Cigar Matchups, Cigar Reviews, Nicaraguan and tagged Casa Fuego, cheap cigars, Cigar Review, Jose Fuego, Nicaraguan cigars, Robusto, Royal Nicaraguan. Bookmark the permalink.